An Online student in North Carolina validated the importance of the wrap-up video. Likewise, many of my long distance piano students sit with their laptops perched by the piano, reviewing the main practicing goals derived from their lessons, and because of these video helpers, they make significant progress over the short and long term. The same applies to LIVE students who often forget some of the main points made during their lessons and need concrete reminders to improve quality practicing. 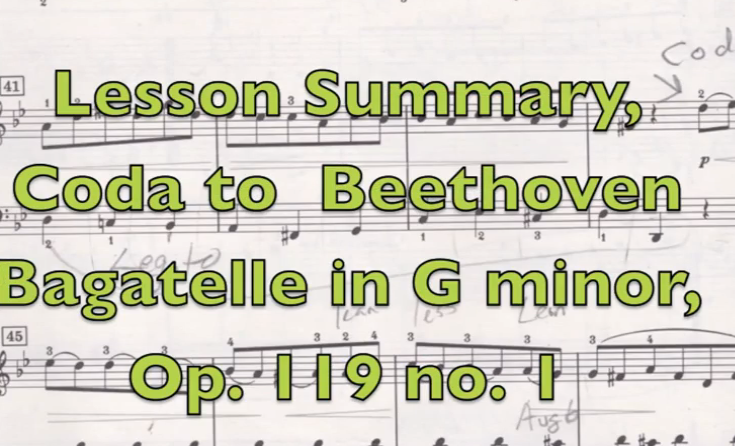 In conclusion, recorded lesson overviews are of great value to piano students while they create an important challenge to the teacher who must crystallize and fine tune approaches to music learning. Shirley, you are an amazing teacher to take the time to do these videos for your students, who are very lucky for this gift! You are a rare caring teacher who goes above and beyond. Yes, the progress would be much faster for the student and for my little ones there would be less mistakes! Now motivated adult students or older teens would be thrilled at these demos. I do know the value of the lesson videos and reviewing at home. However I do all the recording in the lesson and send excerpts to the students so they may look at them and review them at home. You are incredible! I can see the two fold benefit though, to the teacher as well, fine tuning their teaching skills. For young ones, I send videos to the parents so that they can help their children at home. This goes a long way towards progress and saves weeks of difficulties. One funny story… a young child whose Mother does not play piano, was playing anything she wanted at home. Her progress was very slow. To solve the issue, I send videos of each piece she is supposed to practice including scales that I record in the lesson, and how I want it practiced. The Mom has the video to show the sneaky child the correct way and what should be done. However it is a great benefit to the student because now she takes my demonstration of pieces quite seriously and pays attention! She really wants to make sure she learns it correctly. Recently when I resumed piano lessons or coaching as we are calling it, I took two iPads to the teachers house, so I could have two separate views of the lesson. I thought of you and your great set up! Your influence has grown on me and I love it!